I signed up to receive emails on local deals in the Denver area and had one come across my Inbox this morning that I just could not resist. You might recall a previous post about admiring your strongest assets and flaunting them. Well, I thought I’d live up to my own advice. We work hard at keeping up with our running plans, eating well, and staying focused on exercises and activities that keep us strong and healthy. Most people continue to look for ways to improve themselves whether that be physically, mentally, or otherwise, but as humans many of us lack the motivation to keep up with our plans and create a lifestyle out of our improvements. Sure, we can keep it up for a week or two or sometimes even a couple of months, but why is it that it’s so easy to fall back into old habits? Before we know it we’re eating more potato chips, refined and processed foods, and less of the simplest and most delicious things on earth – fruits and vegetables. It’s time to get back to the basics. Simplify your diet (and by diet I don’t mean skimp on food). I love to eat. I could eat all day long, every single day. For me, I need to stuff my face with apples, bananas, cucumbers, carrots and other simple foods like Greek yogurt and milk in order to not sit down and eat an entire bag of potato chips or M&M’s (yes, I’ve done both). But let’s face it. Easy is, well easy. We don’t have to think about it, don’t have to plan anything, but we always seem to regret it. No wonder we never have the motivation to head out the door for a run or pack a healthy lunch. We’re always looking for the easy way out! This is not to say you shouldn’t enjoy food. You just need to retrain your pallet. Don’t let all of that hard work of running and exercising go to the wayside because your brain and stomach can’t work together as a team. Sometimes we just need a little incentive to help us along. My current incentive is not for the upcoming races that I have on the docket. It is not even for my long run on Saturday. My current incentive is the fact that I just signed up for an hour long photo shoot of my derrière. Talk about finding some motivation to eat right and lace up my shoes every morning. It’s time to step out of your comfort zone and get moving! 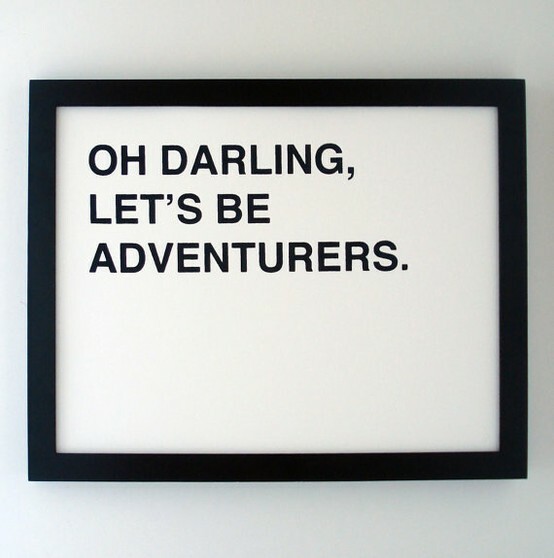 Be adventurous and learn about yourself. You’ll be amazed at what you are capable of. Love my Red Hot Adventuring Wife! Very inspiring post!! And a photo shoot of your bum is sure to be excellent motivation!